We all have the moral obligation (particularly since the past few years) to adopt a responsible attitude towards nature and to endeavor more and more to protect life and the environment and therefore to avoid all pollution. As a naval architect, I cannot interfere with the last two chapters, but I thought it is my contribution to create a range of motorboats which would respect the environment and consume little gas oil per nautical mile. This is both stupid and selfish concerning their own children and the future of the world. In the long run fast motorboats are bound to disappear because they do not respect the environment and also because they cost too much. - Perfect seaworthiness whatever the weather. - Maximum speed corresponding to the normal speed of the hulls of the different boats - and a cruising speed corresponding to the use of the power on board - that is a gas oil consumption of about 0,06 liter per nautical mile per ton. 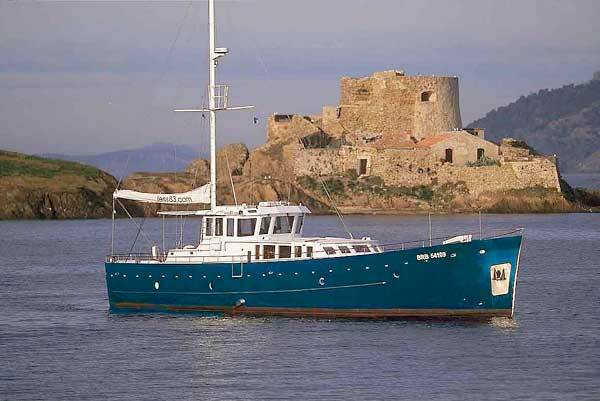 - Maximum room divided into various areas for day-activities, for rest, and for the wheelhouse. - Maximum comfort, smooth sailing, better heat insulation and soundproofing. - Respect of the environment. The 15.000 nautical miles already covered on an Trawler have substantiated those objectives, as well as the adequacy of the adopted solutions, since the actual consumption is 15 % inferior to the preliminary calculation and since, from a nautical point of vew, the reliability, stability and sea-worthiness have proved exceptional and beyond the objectives.